For other people named Shahid Khan, see Shahid Khan (disambiguation). Principal owner of the Jacksonville Jaguars and Fulham F.C. Khan was born in Lahore, Pakistan, to a middle-class family who were involved in the construction industry. His mother (now retired) was a professor of mathematics. He moved to the United States in 1967 at age 16 to study at the University of Illinois at Urbana–Champaign. When he went to the United States, he spent his first night in a $2/night room at the University YMCA, and his first job was washing dishes for $1.20 an hour. He joined the Beta Theta Pi fraternity at the school. He graduated from the UIUC College of Engineering with a BSc in Industrial Engineering in 1971. He later was awarded the Mechanical Science and Engineering Distinguished Alumni Award in 1999. Khan worked at the automotive manufacturing company Flex-N-Gate Corporation while attending the University of Illinois. When he graduated he was hired as the engineering director for the company. In 1978, he started Bumper Works, which made car bumpers for customized pickup trucks and body shop repairs. The transaction involved a $50,000 loan from the Small Business Administration and $16,000 of his savings. In 1980, he bought Flex-N-Gate from his former employer Charles Gleason Butzow, bringing Bumper Works into the fold. Khan grew the company so that it supplied bumpers for the Big Three automakers. In 1984, he began supplying a small number of bumpers for Toyota pickups. By 1987 it was the sole supplier for Toyota pickups and by 1989 it was the sole supplier for the entire Toyota line in the United States. Adopting The Toyota Way increased company efficiency and ability to change its manufacturing process within a few minutes. Since then, the company has grown from $17 million in sales to an estimated $2 billion in 2010. By 2011, Flex-N-Gate had 12,450 employees and 48 manufacturing plants in the United States and several other countries, and took in $3 billion in revenue. In May 2012, the Occupational Safety and Health Administration fined Flex-N-Gate $57,000 for health violations at its Urbana plant. Khan's first attempt to purchase a National Football League team came on February 11, 2010, when he entered into an agreement to acquire 60% of the then-St. Louis Rams from Chip Rosenbloom and Lucia Rodriguez, subject to approval by other NFL owners. However, Stan Kroenke, the minority shareholder of the Rams, ultimately exercised a clause in his ownership agreement to match any proposed bid. On November 29, 2011, Khan agreed to purchase the Jacksonville Jaguars from Wayne Weaver and his ownership group subject to NFL approval. Weaver announced his sale of the team to Khan later that same day. The terms of the deal were not immediately disclosed, other than a verbal commitment to keep the team in Jacksonville, Florida. The purchase price was estimated to have been $760 million. The NFL owners unanimously approved the purchase on December 14, 2011. The sale was finalized on January 4, 2012 making Khan the first member of an ethnic minority to own an NFL team. Khan is a board member of the NFL Foundation. Khan is one of three owners born outside of the United States of America, the other two being Kim Pegula, born in South Korea, and Zygi Wilf, born in Germany. In July 2013, Khan negotiated the purchase of the London soccer club Fulham of the Premier League from its previous owner, Mohamed Al Fayed. The deal was finalized on July 12, 2013, with the amount estimated between £150–200 million. An official purchase price for the club was not announced with him stating that it was "highly confidential". In 2019 it was revealed that Khan was the lead investor behind the professional wrestling promotion, All Elite Wrestling alongside his son Tony where he is the president of the promotion. Khan became a naturalized American citizen in 1991. Khan has received a number of awards from the University of Illinois, including a Distinguished Alumnus Award in 1999 from the Department of Mechanical Science and Industrial Engineering, the Alumni Award for Distinguished Service in 2006 from the College of Engineering, and (with his wife, Ann Carlson) the Distinguished Service Award in 2005 from the University of Illinois Alumni Association. ^ "Forbes profile: Shahid Khan". Forbes. Retrieved 20 April 2018. ^ "New jaguar cub at zoo shares birthday with Shad Khan". fox30jax.com. Fox 30 News. August 12, 2013. Archived from the original on December 15, 2013. Retrieved October 23, 2013. ^ a b "Shahid Khan - Forbes profile". Forbes.com. Forbes.com LLC. ^ Solomon, Brian (5 September 2012). 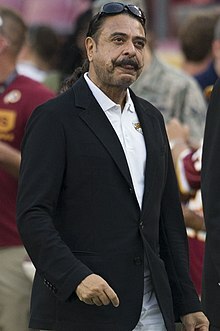 "Shahid Khan- The New Face Of The NFL And The American Dream". Forbes.com. Forbes.com LLC. Retrieved 2012-09-20. ^ Raza, Ahsan (22 September 2012). "Lahore-born entrepreneur among US richest people". Dawn. Retrieved 25 September 2012. ^ a b c James P. Womack and Daniel T. Jones, Lean Thinking: Banish Waste and Create Wealth in Your Corporation, Free Press, 2nd ed., 2003, ISBN 0-7432-4927-5. ^ a b Sandomir, Richard (December 1, 2011). "Jaguars Buyer Had His Eye on Ownership of a Franchise". The New York Times. Retrieved December 1, 2011. ^ "Jacksonville News Sports and Entertainment - jacksonville.com". ^ "MechSE Distinguished Alumni". Archived from the original on 2015-11-17. ^ a b Professorship Profiles: Shahid and Ann Carlson Khan Archived 2010-06-26 at the Wayback Machine, Center on Health, Aging and Disability, UIUC College of Applied Health Sciences (retrieved February 12, 2010). ^ "Who is Shahid Khan?" Archived 2010-03-23 at the Wayback Machine, St. Louis Post-Dispatch, February 11, 2010. ^ Donald P. Cushman and Sarah Sanderson King, Continuously Improving an Organization's Performance: High-Speed Management, State University of New York Press, 1997, ISBN 0-7914-3311-0. ^ Thomas H. Klier and James Rubenstein, Who Really Made Your Car? Restructuring and Geographic Change in the Auto Industry, W.E. Upjohn Institute for Employment Research, 2008, ISBN 0-88099-334-0. ^ a b Rams will be sold to Illinois businessman Shahid Khan Archived 2010-02-13 at the Wayback Machine, St. Louis Post-Dispatch, February 11, 2010. ^ Wade, Patrick. "OSHA fines Flex-N-Gate $57,000". The News-Gazette. Retrieved 15 June 2012. ^ "Stan Kroenke is new Rams owner", AP at ESPN.com, August 25, 2010. ^ "Not a doubt in Weavers' mind that team will stay in Jacksonville". November 29, 2011. Retrieved 29 November 2011. ^ "Sold for 760 Million". November 29, 2011. Retrieved 29 November 2011. ^ "It's Unanimous: Jacksonville Jaguars Sale to Shahid Khan Approved". December 14, 2011. Archived from the original on July 30, 2012. Retrieved December 14, 2011. ^ "The NFL Foundation Board". Retrieved 7 February 2015. ^ "Shad Khan finalizes purchase of Premier League's Fulham soccer club". The Florida Times-Union. July 12, 2013. Retrieved July 12, 2013. ^ "Fulham: Owner Shahid Khan wants to take Fulham to 'next level'". BBC Sport. 13 July 2013. Retrieved 14 July 2013.